As I mentioned in my last post, I recently had the opportunity to accompany my son on a small part of his bike ride from Amsterdam to Spain. Riding a bicycle is the best way to experience a landscape, see the plants and animals, feel the air, hear the insects, and smell the forests. We met in Bordeaux and the journey led us to the beach resort of Arcachon, past the largest sand dunes of Europe, through the endless pine forests of the Landes de Gascogne, and finally into the Basque country near the Spanish border, where the Pyrenees meet the Atlantic Ocean. The entire coastline up to Bayonne is sandy, with endless beaches and pine forests (visible in the background). South from Bayonne, where the Pyrenees drop down to the Ocean, it changes dramatically and consists of ledge and cliffs. European Sea Mustard or Searocket (Cakile maritima) can be found on beaches close to the water line. It tolerates high concentrations of salt. The foliage is somewhat succulent. 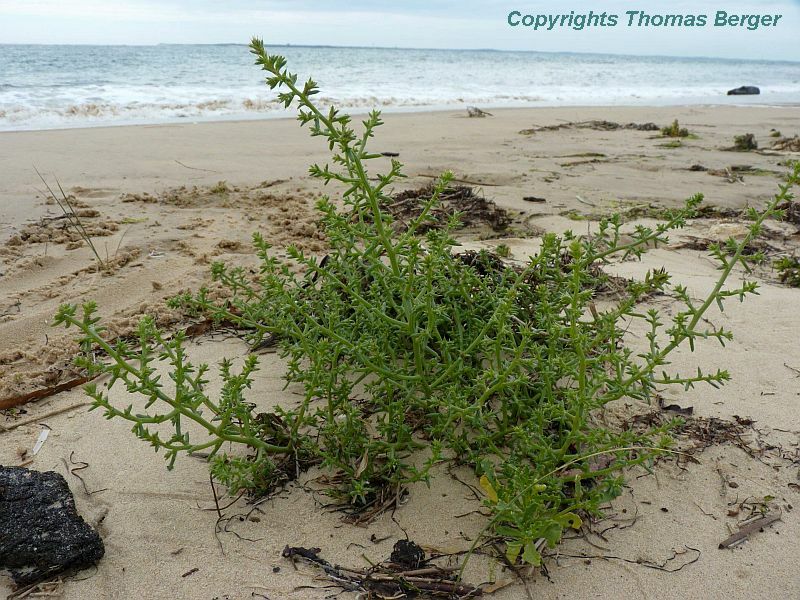 Prickly Sea Wort (Salsola kali, or Kali turgida) grows right at the water line. Sea Holly (Eryngium maritimum) has striking silvery-blue foliage and thistle-like flowers. 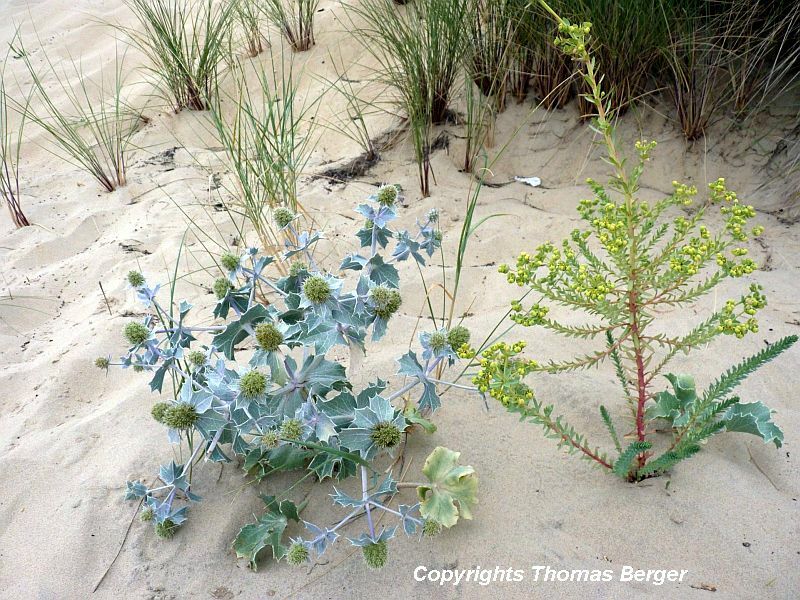 Slightly up the beach, where the waves reach less frequently, a wider range of plants can be found. Sea Spurge (Euphorbia parallias) is widespread on the upper beach. Here we see a Sea Spurge with seeds developing. European Marram Grass, also called European Beach Grass (Ammophila arenaria), is salt tolerant and well-adapted to the sand dune habitat of the Atlantic coast. Marram Grass spreads by stolons that anchor it in the sand, even in the shifting sand of moving dunes. It can form large numbers of new shoots in a short time, each of which will form into a new plant. Here we see the inflorescence of Marram Grass. At every node of the rhizom a new plant can form and send roots into the ground. Juncus arenarius also spreads by rhizoms. Elymus farctus is another common grass adapted to coastal sand dunes. The leaf blades have a strong bluish cast. Hare's Tail Grass (Lagurus ovatus) is an annual species typical of sand dunes and the edges of pine forests. Grey Hair Grass (Corynephorus canescens) is a small grass specialized to grow in locations with poor-quality sandy soils. It tolerates extreme drought and is competitive in sites with very low levels of organic matter and nutrients. 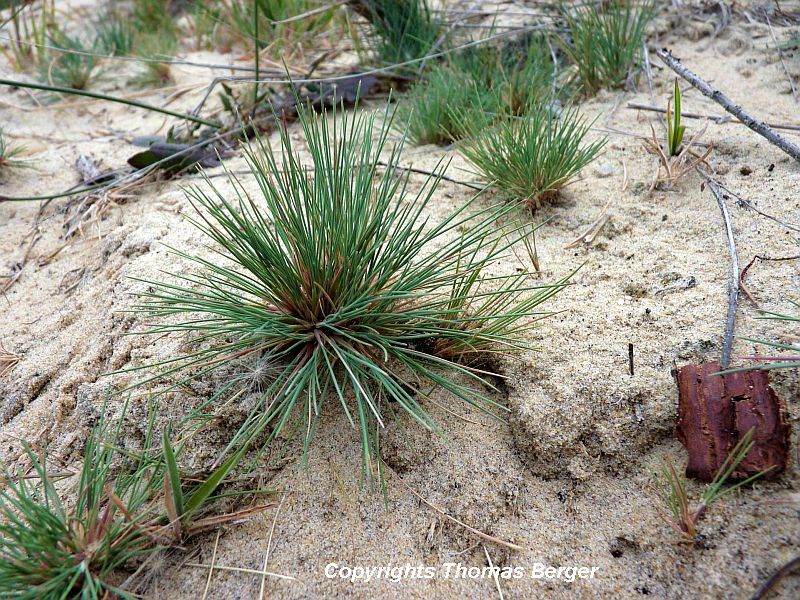 Typically it is found on sand dunes and in parts of birch or pine forests that have sandy soil. 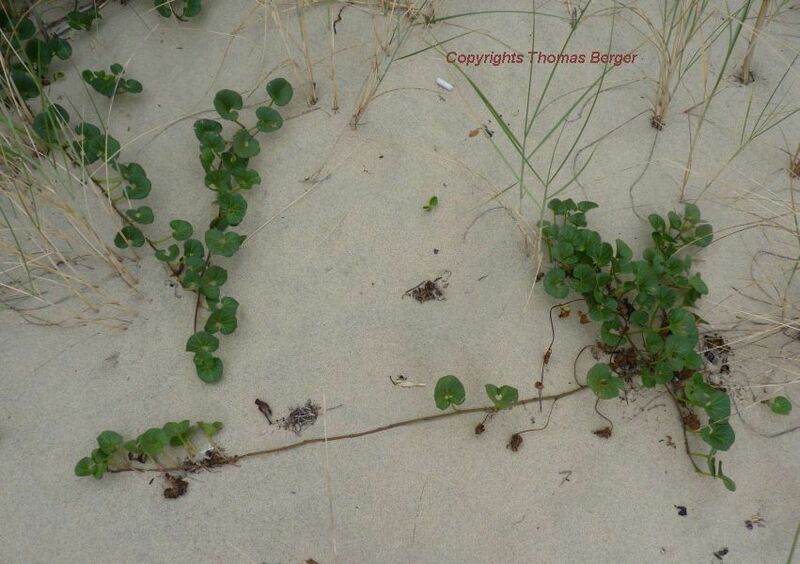 Sea Bindweed (Calystegia soldanella) is a specialized plant that colonizes sand dunes. Like Marram Grass and other dune grasses, it forms horizontal rhizomes that root into the sand. The foliage is very thick and waxy, enabling the plant to store water and minimize moisture loss through the surface. Shrubby Everlasting (Helichrysum stoechas) has linear leaves that minimize water loss. It blooms with yellow flowers during the summer. This low growing Campion species (Silene thorei) is a perfect plant for a rock garden. It is low growing, blooms for a long time, and its foliage has a beautiful blue cast. This subspecies of Bird's Foot Trefoil (Lotus corniculatus crassifolius) is well-adapted to the sand dune environment. 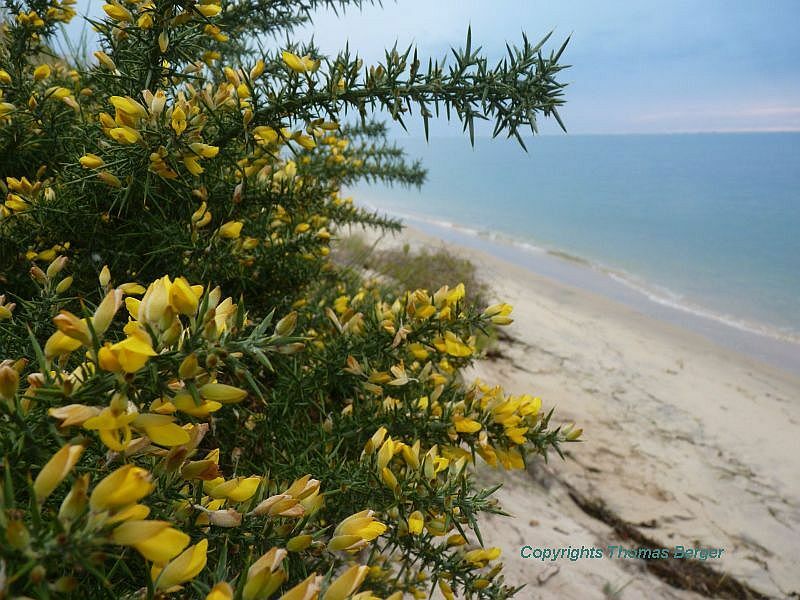 Among the woody plants at the foot of sand dunes are the Common Broom (Cytisus scoparius). This willow species (Salix) is also among the woody plants found at the foot of sand dunes. Common Gorse (Ulex europaeus) is a very thorny plant with the appearance of and in the same family (Fabacea) as Common Broom. Historically, it was hit with a big stone to break the thorns and fed to horses, goats and sheep. Snails are generally inactive during the dry period of summer, becoming active only after a heavy rain. Coastal cliffs south of Biarritz, close to the Spanish border. Samphire (Crithmum maritimum) is an edible plant and was once sold in markets in Great Britain, where it is now a protected plant. It was historically eaten pickled or fresh in salads. It belongs to the parsley family (Umbelliferae), has succulent leaves, and is very common on the cliffs of the Basque region. The border between France and Spain is marked by a river and beautiful tidal wetlands. 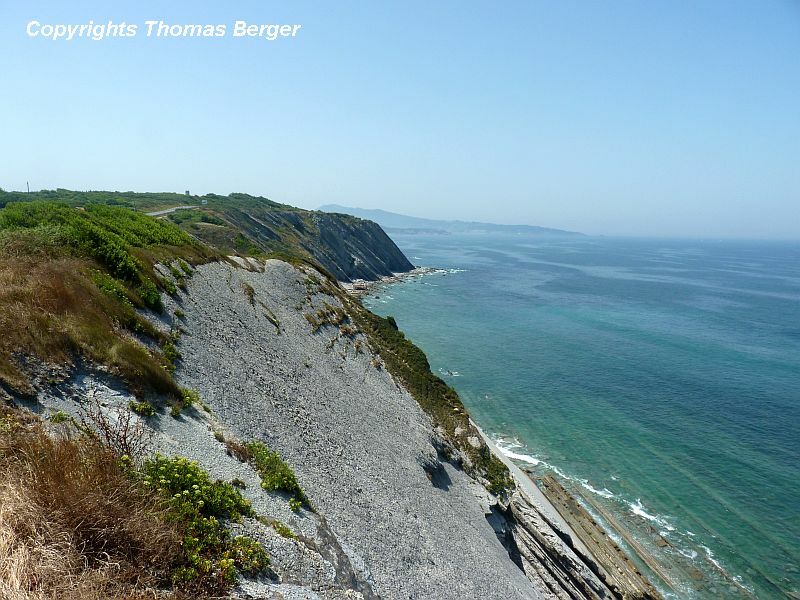 With its west-facing views, the coast of Aquitaine is known for its spectacular sunsets.